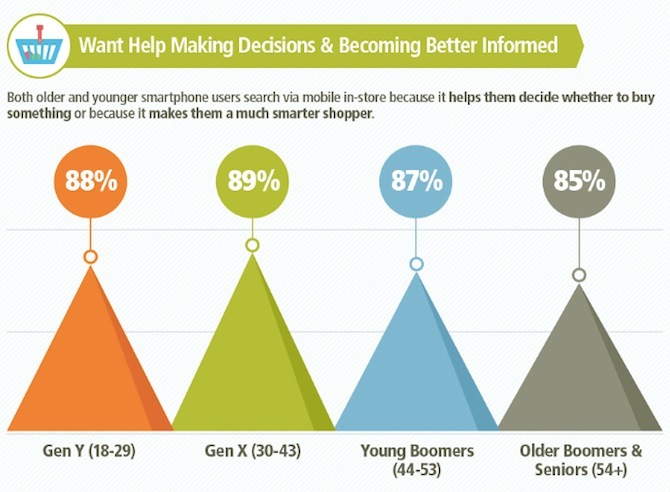 Older consumers are far more in-touch with their mobile devices than most marketers give them credit for. If you search “mobile shoppers” in Google Images, you’ll find yourself staring at a screen filled exclusively with photos of hip 20-somethings clutching colorful shopping bags in one hand and an iPhone in the other. 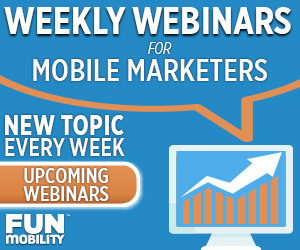 If you thought mobile marketing only applied to millennials, no one would blame you. But reality, as it turns out, looks somewhat different. 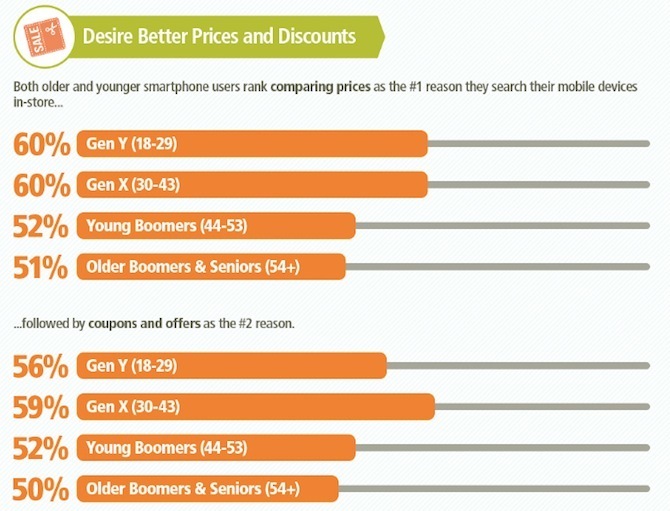 Though Baby Boomers and Seniors have traditionally been relegated to “afterthought” status by the majority of mobile marketing strategies (typically targeted at younger shoppers), a recent study conducted by Thrive Analytics and released by the Local Search Association indicates that older generations actually use their smartphones while shopping in virtually the same manner as the supposedly more tech-savvy Generations X and Y. 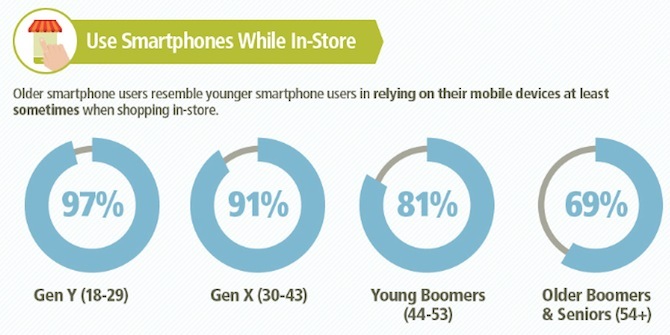 While the youngest demographics were more likely to rely on their smartphone while in-store (97%-91%), the percentage of older shoppers who do the same was still an overwhelming majority (81%-69%), indicating that mobile interaction is already an integral part of the shopping experience for every segment of the population. This is an especially important data point for industries that cater to older generations, as it underlines the importance of implementing a strong mobile presence, regardless of what goods are being sold. Companies like Ace Hardware, for example—which tend to target older customers—have seen dramatic results from their mobile marketing campaigns. Across the board, people cited the ability to compare prices and mobile coupons & offers as the two principle reasons they used their smartphones while shopping. And young and old alike stated that they would stop moving forward with a purchase if they discovered a better deal elsewhere. In fact, another recent study from Omnico Group suggests that Boomers are far more likely to engage in “showrooming”—comparing prices online—than their younger counterparts. “Some people may be surprised to see Generation Y–’The Smartphone Generation’–as less savvy than their parents and grandparents when it comes to shopping for offers whilst on the go.” — Steve Thomas, CTO of Omnico Group. This suggests that there already exists a built-in expectation that mobile will help customers save money—and that brands which do not leverage mobile to provide customers with attractive promotions risk losing business to competitors who do, regardless of their target demographic’s age. Virtually everyone reported using their smartphone in-store to educate themselves before making a purchase. Once again, age was not a significant factor regarding the rate at which customers search for information to help determine whether or not to buy a given product. The key thing to takeaway from this is the fact that mobile has an overwhelming influence on a customer’s decision making process. A rich mobile presence is an absolute necessity to engage shoppers during this critical stage, and to reassure them that they are making the right decision with their purchase. Lacking any outside incentive, only 30% of older shoppers said that they were willing to share their location with others by “checking in” at a business via their smartphone. But that number more than doubles when the process generates rewards or points for a loyalty program—cited as the primary reason why Boomers and seniors choose to provide businesses with valuable location data. 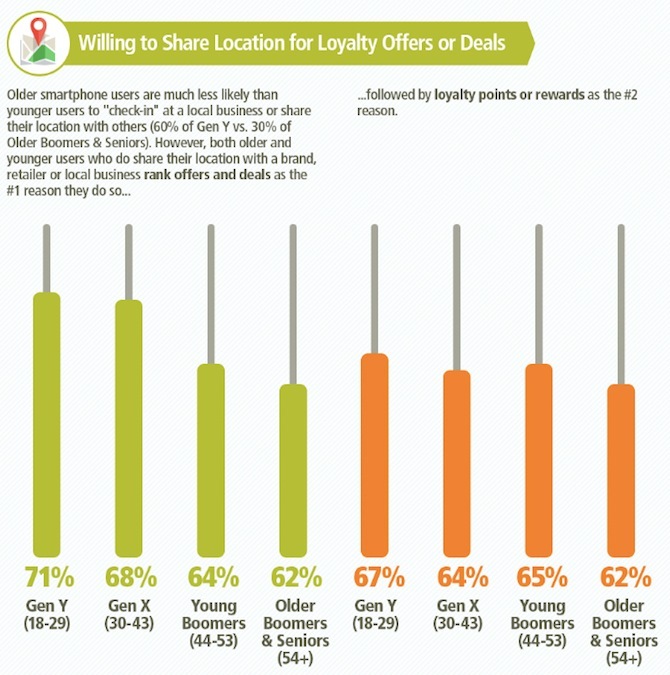 When asked about signing up for a mobile loyalty program, nearly half (49%) of the people surveyed—including a solid percentage of older customers—indicated that they have already done so, motivated by the prospect of special promotions, rewards, and engaging content shared with them via SMS. The overwhelming value of investing in a well-developed and attractive mobile loyalty program is the obvious takeaway here. Not only do these programs possess intrinsic value—allowing businesses to easily remarket to loyal customers—the subscription process itself can also serve as a powerful incentive to influence consumer behavior in-store.